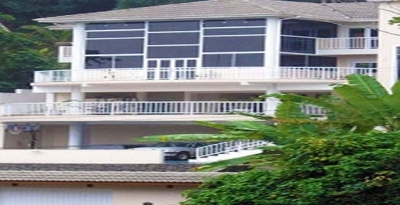 Our Brazilian beach vacation House is a place where each guest will be delighted by beauty and comfort. A friendly staff, large rooms, wireless internet access, digital television, DVD players, books, and a great workout area are at your disposal. Guests will love the Brazilian way of life! The beach house sits on a hill overlooking the ocean and is located in the "Serra do Mar Mountains" which split the coastline up into various beaches. You have a beautiful beach to walk and swim directly in front of the house (Tenorio Beach), a great beach for surfing a 2 minute walk away (Praia Vermelha do Centro) and another great beach for socializing in a fun crowd about three quarters of a mile away (Praia Grande). Downtown is about one mile away and where you will find spectacular restaurants specialized in Brazilian, Italian and Portuguese cuisine. You will also find great cafes where you can sip a cappuccino and read a good book. The Brazilian beach vacation house for rent has five bedrooms (each with its own bathroom) with great beds covered by Egyptian cotton sheets. You will fall asleep and wake to the sound of crashing waves. A breathtaking Brazilian beach view will give you plenty of energy to enjoy the beach, pool, Jacuzzi, sauna, and workout equipment. Beach House Details: Five Bedrooms and seven Bathrooms, Reading Room - over 1000 English, Spanish and Portuguese books for all reading tastes, Home Office - Wireless Internet access, printer, fax, propane barbecue grill by the main area of house with Hammocks and a table with eight chairs, Bar and Wine Area, Workout equipment, Sauna, Massage table, Big Pool area with Jacuzzi and a large coal barbecue grill, bar area, and many lounging chairs. There is a house cleaner and a gardener/pool/maintenance person onsite available to help at any time and upon your request your stay can be complemented by a driver/car, personal fitness trainer and massage therapist. There are also many extra fun amenities at the Brazilian beach vacation house such as: karaoke machine, playing cards, family games, basketball hoop, foosball, beach toys, surf boards, football, soccer ball, volleyball, and pool floaters are ready for you, your family and friends. Prices are for 8 guests.